Flavoring: Alcohol - Liquor, Other Misc. 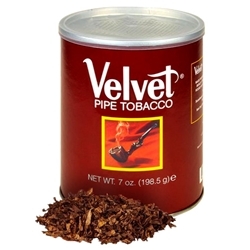 "America's Smoothest Smoke”, Velvet Pipe Tobacco is an American classic, made from ripe Kentucky Burley with a pleasant sweet taste. It's a simple, uncomplicated pipe tobacco with a mellow flavor and aroma that will transport you back to the "good old days." Try some sweet Velvet here at Smokers Discounts!